A mistake. An accident. Unwanted. Ana was never meant to be born to the Range. The people of Range have been reincarnated again and again and again for thousands of years. Then, Ana is born in the place of one of the million souls who have been reincarnated since the beginning. Some, like her best friend Sam, view Ana’s birth as a new age. Other people, like her mother, see Ana as a sign of the end. Born into an unwelcoming world, Ana must face assassins, dragons, shadow creatures, and much more, but with Sam there to help her, she might make it and even learn why she exists. Teenagers who enjoy dystopian literature would enjoy Incarnate. Meadows’ unique writing style is direct and understandable without being obvious. The author created an idyllic world striving to move forward and protect itself in an inhospitable environment. 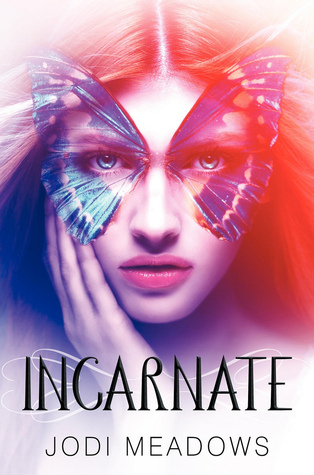 Incarnate would be appreciated by mature readers. Jodie Meadows earns five out of five stars from me. The author’s idea is unlike anything I have heard of and very fresh. Every character has a unique personality. Ana is a dynamic character trying to understand her existence while navigating the confusing emotions felt by a teenager in love. She works incredibly hard to live in a world that many believe she was never supposed to be born into. Readers will cheer for Ana and be excited during her successes. I am very happy this book is a trilogy; I cannot wait to read what Jodi Meadows will write next. Ive heard mixed reviews about ths, but great review, it made me want to read it. I like the unique plot idea. Great review! The book sounds really interesting. This sounds so different. I'd be willing to give it a try. Thank you all for commenting! This is a great book, you definitely should at least pick it up. This book is hunting me! I can't wait to get my hands on it. The cover is just so pretty!